For some people the whiter their teeth are, the better. They will go to great lengths to make sure their pearly whites remain that way; they brush thoroughly every day, go to the dentist twice a year, use teeth-whitening products, and stay away from foods or drinks that might stain them. However, in some cases teeth that seem to be perfectly healthy start showing a sort of white blotch or blotches on the surface. It draws attention because they are a different shade of white and it can be quite unsightly. 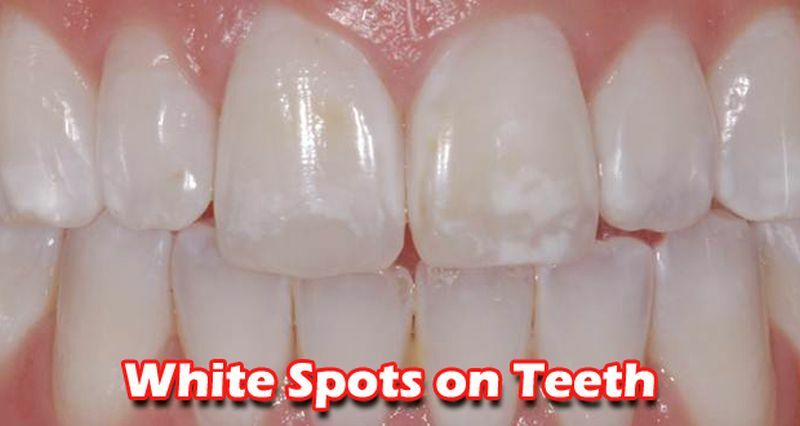 The reason for these white spots can vary and they can be an indication of decay, so it’s good to know why they show up. Diet: if you eat foods that are highly acidic, they can cause white spots on your teeth. The acid in these foods will eat away the enamel of your teeth and this is the layer that is in charge of protecting your teeth. High sugar intake also promotes the formation of acidic plaque that erodes enamel as well. These foods and drinks include sodas, certain fruits (lemons, grapefruit and oranges) and sweets. If your diet is causing you to have acid reflux, it will also contribute to tooth erosion. When your enamel starts to break down, you will feel tooth sensitivity to cold or hot food and drinks. Fluorosis: while we use fluoride to help us prevent tooth decay and strengthen teeth, too much of it when the teeth are developing will actually have the opposite effect. It will cause decay and discoloration. It’s one of the reasons why it’s important to supervise children when they are brushing their teeth, since this excess of fluoride occurs in part if they swallow toothpaste instead of spitting it out. Another characteristic of fluorosis is pitted enamel, which will make brushing and cleaning teeth a lot harder. Enamel hypoplasia: this is a structural defect in which the person has less enamel than normal. This can result from a nutritional problem that would cause a significant amount of mineral loss from the teeth. Things like celiac disease could be one of the culprits, since the body struggles with absorbing certain nutrients due to a weak immune system. Enamel hypoplasia also includes the teeth having grooves and lines, as well as sensitivity. Plaque accumulation: this is a direct result of bad hygiene, since it would allow bacteria to accumulate. Sometimes it is also a side effect of orthodontic treatment, since brackets can make it difficult to properly clean between them and it can serve as a bacteria trap. Sleeping with your mouth open: sometimes when you wake up, you might see some small white spots on your teeth that go away after a few hours. This is caused when a person sleeps with their mouth open and the enamel becomes dehydrated because of it. Once saliva coats the tooth again, it remineralizes back to its original state. If you want to remove those white spots from your teeth, there are several ways to get rid of them. All of these procedures should be done by a dentist. Microabrasion: this removes a layer of enamel from the tooth and it can remove white spots and other stains. Bleaching: it’s a method for tooth-whitening and it helps balance the color of the tooth enamel. It lightens the entire tooth to match the white spots. However, if the spots were caused by fluoride overuse, it won’t be effective since the spots will take a different shade of white and still be visible. Veneers: if the spots are too extensive, maybe the dentist will suggest using porcelain veneers to conceal them. Chin Straps: these will help you if you sleep with your mouth open. White spots can be prevented most of the time by having a good dental hygiene and avoiding highly acidic food and drink. There are toothpastes available that are designed to remineralize enamel and protect the teeth from developing white spots too.